Two of the brightest lights amongst a group of young, professional golfers hailing from the North-east of Scotland today announced a tie-up with leading window and doors manufacturer, NorDan UK Ltd.
Sam Locke and Craig Lawrie, both clients of Paul Lawrie’s Five Star Sports Agency, have agreed deals to represent NorDan and each will bear the distinctive company logo on the front of their headwear. Alex Brown - Managing Director for NorDan UK - said “As an established business in Aberdeen for over 35 years and the market leader in the North of Scotland, we are delighted to be associated with the guys and with Paul Lawrie”. The agreement continues 5 Star’s philosophy of building relationships with business partners strongly rooted in the communities from which their players hail. 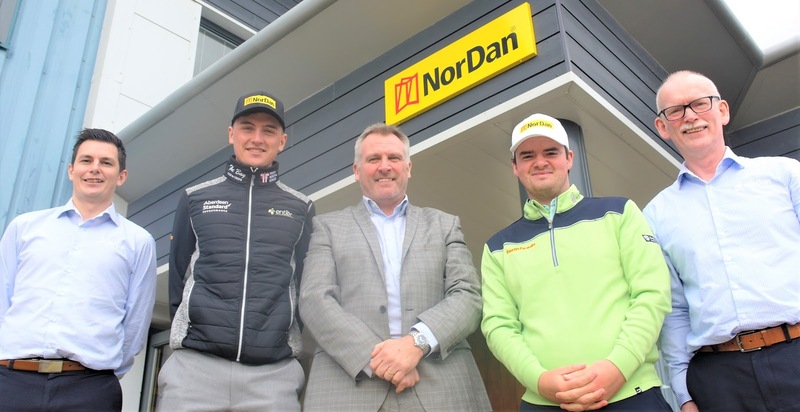 Silver Medallist at last year’s Open Championship, Sam Locke, spoke about the importance of having the support of NorDan – “I’m really grateful to Gordon and Alex and the team at NorDan for their backing. This season I’ll be playing between the European Challenge and EuroPro tours, continuing to gain experience as a Professional and so it’s really important to me in the early stages of my career to have the financial side of things dealt with to allow me to concentrate fully on my game, helping me to perform to my potential”. “Having the support of a company like NorDan, which values relationships so highly and has a great team of people driving it is brilliant. It has a big presence in Aberdeen and the UK headquarters are also based in Scotland, so I’m delighted they’ve chosen to support two local lads. "I’m looking forward to my season getting properly underway in May and representing NorDan”. Gordon Mitchell - Regional Director for Aberdeen said, “This is the first time that NorDan Aberdeen has been involved with golf sponsorship and we’re really keen to follow the progress of Sam and Craig during 2019 and wish them both good luck in the season ahead”. NorDan UK Ltd - the longest lasting Scandinavian supplier of windows and doors in Scotland and England. The head office is located in Livingston, Scotland. Across seven project management offices in Scotland and England we provide market leading services to both project and residential builders across the UK.